The digital India initiative was introduced by Government of India on 1st July 2015. Based on the vision of transforming India into a digitally empowered economy, PM Narendra Modi inaugurated the thought and called it ‘to be the beginning of a new cashless economy’. While in the same event it was also stated that such moves of government can only bring India on a digital track and can uplift the economy from present hoes of cash. Till now the major problem of the economy was driven by unaccounted money and business ways of working with cash. While still today we accept and transact in cash without giving it a second thought of legality. 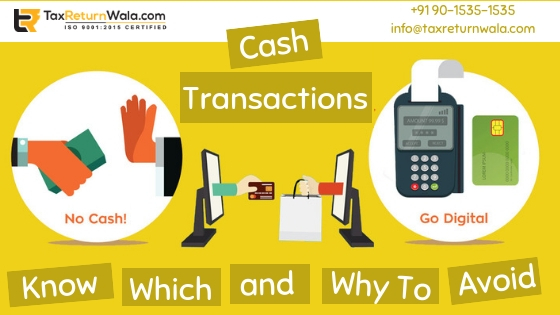 Cash transactions as obvious to say leave no proof of transaction which limits the tax liability and revenue of individual leading to tax evasion possibilities. Earlier, even a minute transaction of business was done in cash which at the closing of the tax filing period was manipulated for showing ill losses of the business. But after the launch of this initiative, the government made rapid changes to the tax laws and provided several incentives to curb such practices. To limit cash in operations, the Section 269ST was introduced in the IT act as per which no cash transaction over Rs 2,00,000 would be permissible from FY 2017-18. It was proposed in the budget of 2017-18, accepting cash to Rs 2 lakh in a single day from a single person for a single transaction would only be allowed. Receiving or making payment for purchase, transfer or any transaction related to any immovable property with cash Rs 20,000 or more can invite for a greater tax liability as per new amendments. Adding up a penalty provision on the receiver, it has also been stated that for above transaction it is the receiver of cash who would be penalized only and not the paying party i.e it is the recipient who is at fault for receiving huge sum and not saying no to cash. If the business transaction value is above Rs 10,000 in cash, it will provisionally attract a tax liability from the department. As per the inserted section 269ST, donations made to any charitable institute, political party, registered or any un-registered trust in cash above Rs 2,000 is not permissible. In addition to above-stated cash restrictions, it was also suggested to disallow deductions and exemptions availed by the taxpayer as provided by various sub-laws of IT Act, if made in cash. In 2017-18, the Finance Minister Mr. Arun Jaitley proposed the annual budget where he proposed to put a strict ban over cash transaction of over Rs 3,00,000. The limit proposed was later lowered to Rs 2,00,000 proposing some new amendments in the Finance Bill. To put the proposed obligations more seriously, another penal Section 271DA was also introduced, where it was stated- to penalize the receiver to an amount equal to the amount of transaction dealt in cash over the above-stated limit. While the section relieves the paying party, it also provides a confined opportunity to the recipient to prove their case for no penalty provision.